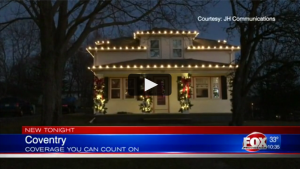 WPRI: Local business provides Coventry veteran with professional Christmas decorations - SeaScape, Inc.
Christmas Décor by Seascape decorated the home of Mark DeCosta and his family. DeCosta is a 12-year retired army veteran who is also responsible for raising over $70,000 for Hasbro Children’s Hospital, along with an annual music festival. Every year around the holidays, Christmas Decor by Seascape decorates the home of a local military family. View the story on WPRI Eyewitness News.